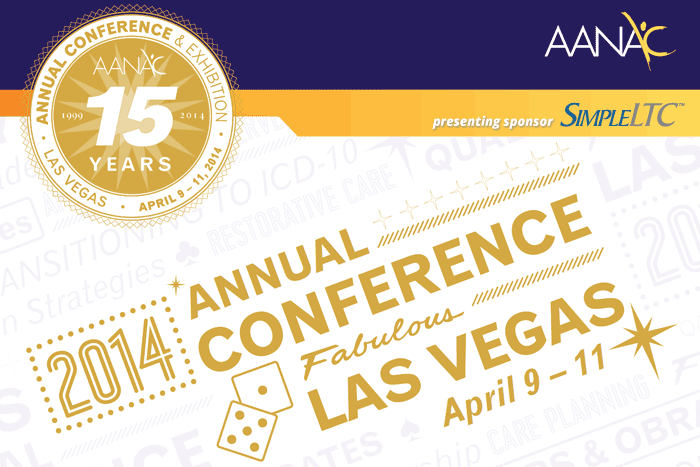 It’s just four weeks until the American Association of Nurse Assessment Coordination (AANAC) hosts its 2014 Annual Conference & Exhibition, April 9-11 at the Hard Rock Hotel and Casino in Las Vegas. This marks the 15th year of AANAC’s existence and their 15th annual event. It’s also the third consecutive year that SimpleLTC will serve as the conference’s main presenting sponsor. We’re excited to be a major part of the event, and not just because of its location. While Las Vegas is always a fun place to attend a conference, we’re more excited about what our partnership with AANAC means for our customers and the new opportunities the conference always brings to attendees. Since 1999, AANAC has worked hard to improve resident quality of care by providing information, education, networking and advocacy opportunities for healthcare professionals. At SimpleLTC, we share these values. With more than 2,000 individual skilled nursing facilities as customers, we work hard toward a very similar goal: improving the lives of individual residents and the industry at large through innovation, information and automation. There are few industry organizations that work so hard to stay ahead of the curve as AANAC. Our industry changes fast and AANAC often serves at the go-to source for information, especially when it comes to the intricacies of MDS 3.0. At SimpleLTC, we believe innovation is the key to not only staying ahead of the curve in long-term care, but leading others in finding new ways to solve problems. Along these lines, SimpleLTC’s Jason Jones will present a special Ignite™ presentation to attendees on the benefits of knowledge sharing. This year’s AANAC conference will cover some of the most pressing topics facing long-term care facilities and MDS staff, including QAPI, reimbursement, corporate compliance, ICD-10 and managed care. At SimpleLTC, we take a similar role when it comes to educating our thousands of individual users (a large percentage of whom are also AANAC members!) in the areas of regulatory compliance, reimbursement optimization and quality measurement. We all work in long-term care. At SimpleLTC, we believe the most significant word in the name of our industry is “care,” because it’s meaningful on several levels. There’s the care that’s provided to an individual resident at a skilled nursing facility. There’s the care with which AANAC members treat their individual job responsibilities. And there’s the care that we all extend to each other in our relationships as co-workers, partners and friends who are all striving to improve our industry. We hope you’ll join us at this year’s AANAC conference. We’re very proud to be an AANAC partner and to help bring this important event to an expected 1,000+ attendees and partners.